The Suboken Project is expanding our palette once again. 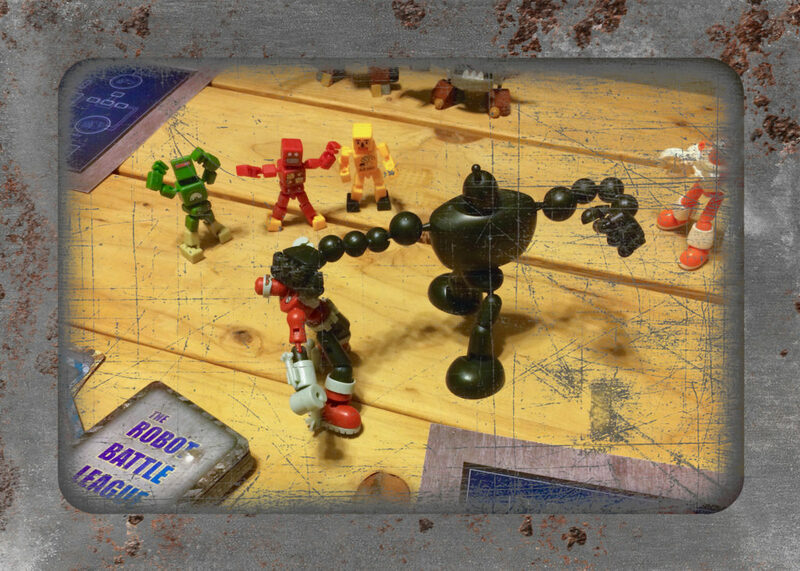 This time, we’re offering an original card game: The Robot Battle League. We’ve been developing this project since 2013, and have reached a point where we think it is ready to be introduced to a wider audience. The Robot Battle League is a self contained turn based card game, ideal for 2 to 6 players. Players use their game cards to perform combat actions with the goal of “taking-down” their opponents in a robotic battle royale. Fights between robots consists of attacks that deplete their opponent’s shields and destroy targeted robot features, crippling their opponent’s ability to fight. We’ll post more details about the game soon. If you live near enough to the Palm Desert, Indio, Palm Springs area to participate in one of our upcoming play tests, please drop us a message using the contact form on suboken.com. UPDATE: Justin from Palm Springs Comic Con is hosting weekly Game Night events in Palm Springs and has invited us to present The Robot Battle League as a reoccurring featured guest. Please come joins us and test your card playing combat skills. Follow The Robot Battle League on Facebook for updates.